In our daily lives, we use many products that are made of metal. Cutting tools refers to machining tools that are used to cut and shape such metal materials (primarily iron-based materials) into the desired shape. During the cutting process, cutting tools are pushed into the material at a rapid speed, producing friction, which can cause serious shocks and heat. Cutting tools must therefore be hard enough to withstand such effects. Cutting tools are both perishable goods and important parts that affect the operation rate of machinery. Cutting tools that are designed according to the material and machining shape, help support Japan’s formidable manufacturing sector. 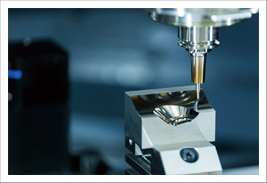 In order to achieve the machining accuracy that end users expect, Chuo Koki responds promptly to inquiries, provides the most up-to-date information, and supports the design and development of new high-precision tools. We provide exceptional cutting tools that deliver the right price-performance ratio with a goal of achieving value engineering whereby functionality is combined with reasonable price in order to increase value. With the aim of utilizing our ability to support the development of specialist tools and secure competitive superiority, we are advancing initiatives to realize value analysis that delivers the best human resources and cost distribution throughout business activities, which include manufacturer-led research and development and appropriate tool direction and after-sale support provided by Chuo Koki. Far East Machine Tool Co., Ltd.
Sanyo Tool Mfg. Co., Ltd.